Project Car Hell: Fiat or Austin-Healey? We'll have more on Jay's ungodly cool collection of rare flat-front Econolines later on, of course; in any case, he definitely knows his way around 60s Ford hardware. I've always liked this mean-looking wagon, so I came right over when I heard it was for sale. The first thing he did when he got this wagon a couple decades ago was to ditch the 6-banger and drop in a 289/C4 combo. Then he installed a dual-reservoir master cylinder (they weren't required in the US until the '66 model year). Then he rebuilt the suspension and fixed all the little stuff that didn't work. The cool thing about this car is that everything works. He wants to keep the 289, which is fine with me; were I to buy this wagon, I'd grab a 5.0 HO out of a late-80s Mark VII and drop it in. Right there you get weeks of hell, what with Ford's 5 million different bellhousing/flywheel combos, plus the wiring and fuel-injection plumbing. Then, of course, I'd need a manual transmission; if you're going to have a bench seat, you must have a floor-shift manual trans! I know a guy with a Toploader he'll sell cheap, but the junkyards are full of Mustangs with T-5s. Naturally, Jay has all the Falcon clutch pedal/linkage hardware I'd need. Hell, he even has the Falcon-only shifter housing for the transmission hump! This wagon has a bunch of 60s-vintage travel stickers on the rear side glass. Oh yeah! The Biggest Little City in the World! Every station wagon needs faded travel stickers. So, if I got this wagon, I'd soak it with a thick coat of black primer. Then apply the biggest wheels and tires that fit in the wheelwells. Chop a few inches out of the front suspension. Cherry Bomb exhaust, of course, and maybe a nice JC Whitney fiberglass hood scoop. The problem is, I wouldn't be breaking any new ground with such a project. 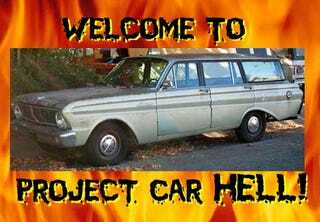 I've had a bunch of 60s Fords, so I'd be able to evade some of the pitfalls that make Project Car Hell so maddeningly fun. Then, too, the hot-rodded primered station wagon has become a bit too hipster-ish for comfort in recent years. And, of course, there's the godawful suspension on these cars; just ask the Mustang guys how much it costs them to upgrade the front suspension from "dangerous" to merely "sucky" and you get the picture. At least it's no sweat throwing disc brakes on the Falcon/Mustang, thanks to the ready availability of Ford Granada parts. It's got a bit of California-style roof rust, too. Not that I'd care too much, of course, but leakage is a drag. So, really, taking on this project would be sort of a punt for me, albeit a punt with a seriously fun car as the end result. What I'm mostly considering for a project, however, would be something involving junkyard turbocharging and Megasquirtage. I like the idea of a (smog-exempt) '75 Volvo wagon with a Detroit V8 and remote turbocharger gear in the cargo area, or an early-70s Buick Apollo/Olds Omega/Pontiac Ventura with a turbo-ized GMC 292 six. But there are other options as well. What say you, readers?